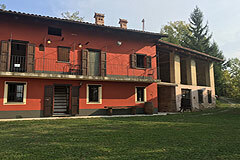 Country House with Barn for sale in Piemonte Dogliani The Langhe near Alba & Dogliani (ref: 8046)- Restored Italian Country home with two Langhe stone barns for restoration enjoying beautiful views over the surrounding countryside, vineyards and mountains.. Piedmont Properties in Piemonte. Property for sale Langhe and Piemonte. Map for Property ref: 8046, Country House with Barn for sale in Piemonte - Restored Italian Country home with two Langhe stone barns for restoration enjoying beautiful views over the surrounding countryside, vineyards and mountains.